Jaguar's F-Type Coupe is a thoroughbred sports car with clear, elegant lines that evoke the glorious past. Its modern classic image is underpinned by the cutting edge engine and chassis technology, creating a desirable machine that ticks all the right boxes for today's premium sports car buyer. Inspired by the F-Type's gorgeous looks and outstanding dynamic ability, Marcus Piecha - head of PIECHA Design - has now created the Jaguar F-Type Evolution, a bespoke sports car that takes the sleek British Coupe to the next level. Taking a leaf from motorsport, the distinctive visual enhancements to the front spoiler and side sills take the form of aerodynamically optimised Front-Cup-Wingsand Side-Sill-Wings that add to the cars sporty appearance and improve its high-speed stability. The large black plastic undertray at the rear of the 3.0-liter V6 powered F-Type has been the cause of many customer complaints, with the two oversized twin tailpipes emerging form the only interesting feature in a large, bland panel. To remedy this visual shortcoming, PIECHA designed an entirely new, larger rear diffuser. Framed by a colour-coded undertray, this has an extended frame to enhance stability and reduce drag. Meanwhile, the big exhaust outlets are now flanked by stainless steel grille inserts, which also help to break up the visual mass of the diffuser. The subtle three-piece integrated rear spoiler lip that now sits on the end of the rear hatch lid gives the sloping rear an elegant finishing line while reducing drag and lift over the rear axle. In this case, the factory extendable rear spoiler remains fully functional. 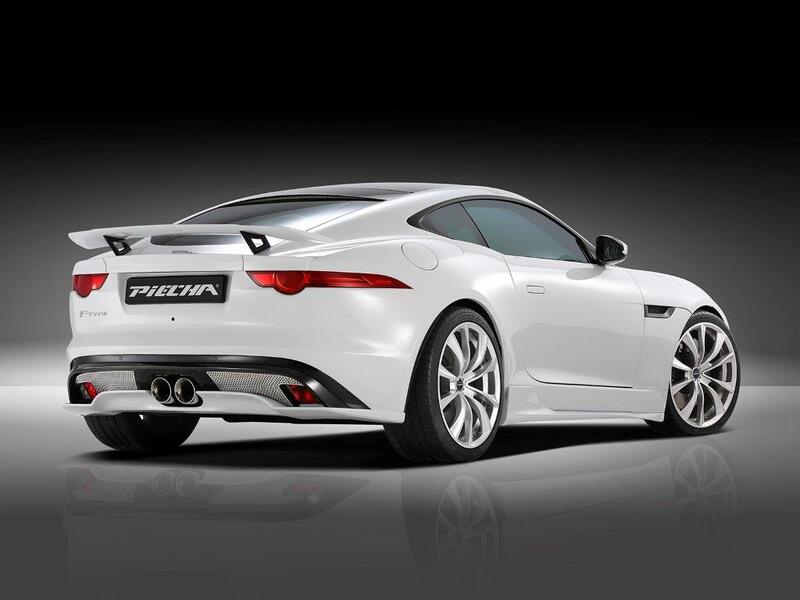 For the more extrovert driver, the optional PIECHA GT rear wing gives the F-Type Coupe a greater motorsport visual connection. The downforce generated by this fixed wing is significantly greater than that of the retractable factory spoiler, whose function is then disabled. To match the aerodynamic enhancements, a set of lowering springs drops the ride height by 30mm. In combination with the choice of 20 or 21-inch diameter PIECHA DESIGN alloy wheels, the car takes on a wider and more purposeful stance with improvements in handling and grip. To further sharpen its claws, the Jaguar F-Type can be equipped with the proven PIECHA Power Converter Module for even more spontaneous throttle response. 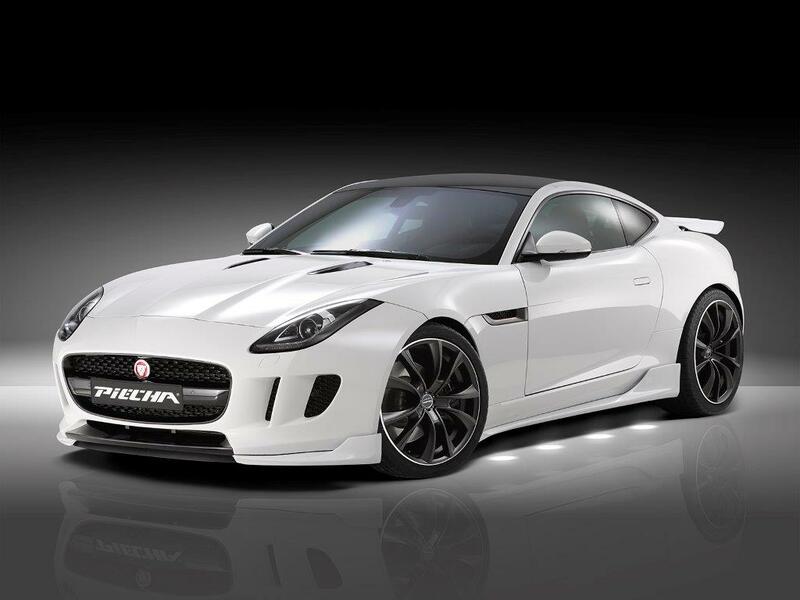 The PIECHA Design Jaguar F-Type 3.0 V6 Coupe EVOLUTION takes the owning and driving experience of this outstanding sports car to the next level. Similar upgrades for the V8 Coupe and convertible models are also available.